The lubrication of the many pieces of equipment required to produce metal cans and drums is unique in respect to the types of lubricants that are required and the importance of lubricant application. In spite of the rather complex synchronizing mechanisms which characterize many of the fast operating units, the entire plant can be lubricated with only a few types of oils and greases. In fact there are only a few places where lubrication is critical with respect to the type of lubricant used. Lubricant application, however, is critical in that the operations require frequent application of small quantities. Excessive amounts of lubricant may be thrown onto the sheet parts being processed and have a detrimental effect on subsequent lithographing and sealing operations. The initial step in converting sheets of steel into can bodies, bottoms and tops is the application of the multi-colored designs and printing which decorate the package and identify its contents. This operation uses five specific pieces of equipment: metal sheet feeder, lithographing press, bake oven, slitter and body maker. This unit is used in all operations where flat sheets are fed to machines for processing. As indicated in Figure 2, a stack of metal sheets weighing as much as four tons is placed on a platform which automatically elevates and maintains the top sheet at the correct height for feeding. An air jet impinging on the sheet edges helps to separate the top sheet. Rubber suction cups located on each side of the feeder, and evacuated by a vacuum pump, then grip it, raise it and move it forward into the machine to which the feeder is attached. These units are designed to feed sheets at a rate of 150 per minute and operate much like their cousins in the paper-printing industry. Figure 2 - High Speed metal sheet feeder. Metal sheet feeders have many moving parts which would normally require frequent lubrication; however this maintenance is greatly simplified by use of oil-impregnated porous bushings, sealed anti-friction bearings and graphite bronze plain bearings. Points requiring daily lubrication may be equipped with oil or grease cups, grease fittings, or automatic lubricators set to deliver small increments of oil at specific intervals. Gears and bearings on feeders are not critical in respect to the types of lubricants: an oil having a viscosity of about 550 SUS@ 100◦ F. (for example an SAE 30 motor oil) and a multi-purpose grease of NLGI No. 2 grade are usually quite adequate. The self-contained air pressure and vacuum pumps in the feeders are more critical in respect to lubrication. Care must be exercised to insure sufficient oil to maintain pressure or vacuum. Pumps must be flushed periodically to remove accumulations of foreign material and compressor oil must be kept out of the discharge air stream lest it soil the metal sheet and impair its printing characteristics. 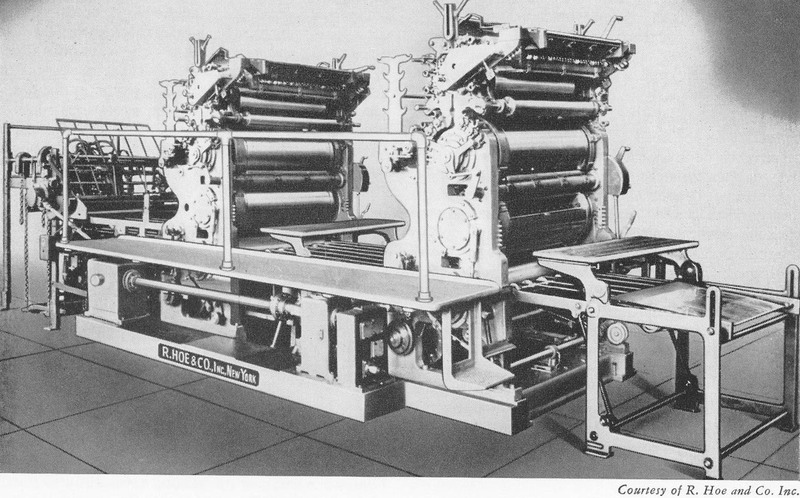 These presses are either single or two-color units (like that shown in Figure 3) for the application of one or two colors respectively to sheets that have previously been given a white base coating. A typical unit consists of plate, blanket and impression rolls for transferring the enamel from the reservoir to the design plate and thence onto the sheet being processed. A number of can bodies are printed on a single sheet and subsequently separated. When more than one color is printed, the successive colors plates must be precisely “registered” to prevent overprinting. The required synchronization between presses or units within the same press is obtained by gear drives. 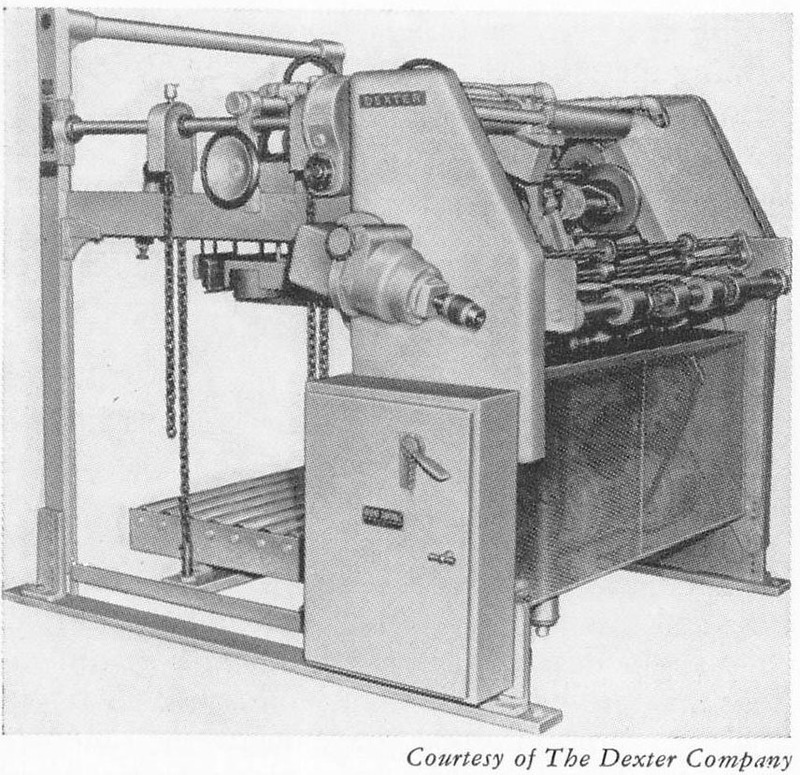 Figure 3 - Two-color metal decorating press. Substantial construction, use of wear resistant metals, and efficient lubrication are all mandatory for efficient press performance, though lubricant types are not critical. A multi-purpose grease of NLGI No. 2 grade or lubricating oil having a viscosity of about 550 SUS @ 100o F. is adequate for bearing lubrication. Since gears are conservatively loaded, a straight mineral oil having a viscosity of about 3000 SUS @ 100o F is usually adequate. All printed metal sheets leaving the lithographing presses must be baked to dry and harden the coating so they can be stacked for subsequent operations. This is done in a continuous bake oven which is frequently over 170 feet long with widths and heights of approximately 12 feet as illustrated in Figure 4. The oven is fabricated from metal panels backed with three inches of insulation to minimize heat losses, and equipped with gas or oil fired heaters and air circulating blowers located so as to divide it into sections of graduated temperature. Temperatures may be as high as 450o F. and are accurately controlled by thermostats. Figure 4 - Rotary air oven for drying lithographed metal sheets. Note sheet feeder and coater at the left. The sheets are automatically fed onto an endless roller-chain conveyor equipped with tubular steel wickets which support the sheets in an essentially vertical position and move them through the oven at a rate as high as 150 sheets per minute. High temperatures and the gradual movement of air counter current to the sheet travel insure complete baking and elimination of paint solvent vapors from the final sections. The high temperatures to which the chains are exposed make their lubrication extremely critical. All petroleum lubricants are susceptible to oxidation when exposed in thin films to high temperatures. This characteristic can be minimized by the selection of crudes, refining procedures and the incorporation of additive materials. The oxidation of lubricants is accompanied by an increase in viscosity and the ultimate formation of carbonaceous and varnish-like materials. All there oil oxidation effects impair the lubrication of conveyor roller chains in bake ovens by increasing wear and power input requirements. Excessive lubrication also results in sludge and carbon formation and must be avoided. Application of minimum amounts of an extremely heat stable oil like the SAE 30 grade of a “heavy duty” detergent motor oil is necessary to obtain satisfactory results. The many motor-driven fans located on both sides of the oven operate at much higher than normal temperatures and require special consideration in respect to lubrication. Grease-lubricated motor bearings in this service require the NLGI No. 2 or No. 3 grade of grease having a high dropping point and exceptionally high head resistance. Bearings and gears on these units are not exposed to high temperatures can be satisfactorily lubricated with the lubricants suggested for lithographing presses. The lithographed sheets with their multiple printings of can bodies must be cut into individual body blanks before further processing. This is done on a slitter like that shown in Figure 5 in which circular tungsten-carbide “knives” perform the cutting operation in either one or both directions depending on machine design and the size of the body blanks being processed. The knives are spaced along the slitter shafts which are mounted on antifriction bearings. Adjustable idler bearings are frequently placed at the middle of the shafts to prevent misalignment. In older machines the replacement of plain bearings with antifriction bearings has minimized adjustments necessary due to bearing wear and extended the period between the knife sharpening. A multi-purpose oil of about 300 SUS viscosity at 100o F. and a multi-purpose grease of NLGI No. 2 grade provide satisfactory lubrication. 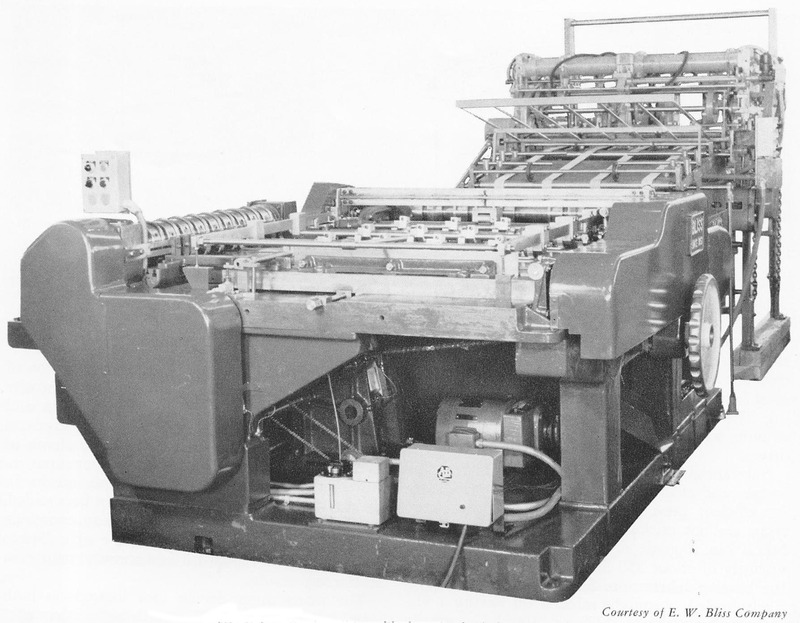 Figure 5 - Duplex slitter with sheet feeder in background. The processing steps required to produce single lithographed can body blanks can be considered as auxiliary operations to the actual can making which starts with the body makers. This also applies to the several operations required to produce the ends, caps, spouts and handles. Formation of the can bodies may be considered as the heart of the operation and care must be exercised to insure maximum production efficiency of the equipment used. The importance of one of these units in the integrated operations is readily recognized when one considers its throughput of 15,000 can bodies an hour. Single units, such as shown in Figure 6, are designed to make different sizes of round, square and rectangular can bodies. In spite of the speed at which the body maker operates, the procedure is complicated and the finished product must meet exacting requirements. Each operation is synchronized by take-offs from the main crankshaft. Body blanks are fed to the machine by a metal sheet feeder and are subjected to flexing, slitting and notching operations prior to rolling into the can body. The body seam can be made leakproof either by soldering or welding, or by using an oil-insoluble resinous cement as illustrated in Figure 7. The latter is used on one-quart non-refillable motor oil cans while soldered seams are used on the larger sized containers due to the greater flexibility of their longer seams. Perfectly square rolling and thorough sealing of body joints are necessary to minimize leaky containers which would be rejected in subsequent test machines. 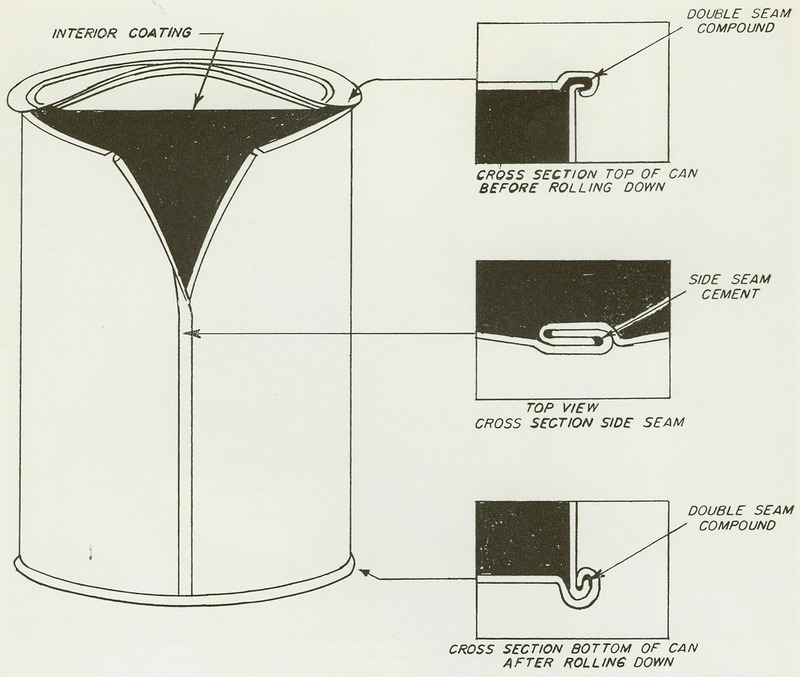 Figure 7 - Seam construction in a quart motor oil can. The same oils and greases used on the feeders and slitters are used in the body makers. The high capacity of these units and the high value assessed to production time makes it very economical to install some type of centralized lubricating system. The final step in body construction is done on the flangers which flare the top and bottom one eighth of an inch of each can body outward to receive the can top and bottom. This is accomplished by forcing flanging dies into both ends of the can body simultaneously. All information contained on this site is for personal use only. Any trademarks or trade names are the property of their respective owners.